I’ve long been a fan of this Vietnamese chain, frequenting the Brighton restaurant in past and occasionally eating in the Wardour Street branch. Last month their newest branch in Spitalfields kindly offered me a complimentary lunch, a proposition I could hardly refuse (it’s no surprise how keen I am on South-East Asian food, after all). Located in a stylish old house close to Liverpool Street station, Pho is cosy a space made big by a great use of light, inspired décor, and friendly atmosphere. Upstairs is the takeaway counter, which I appreciate being separate from the restaurant to avoid congestion and confusion. The Pho menu is broken down into six sections: Starters / Sides dishes, Goi (Vietnamese salads), Pho noodle soup, Bun noodles, Pho xao, and Cari. There’s at least one vegan (or veganisable) option under each heading (Spitalfields takeaway menu also offers banh mi, but sadly there are no vegan options there). Out of the forty-two or so items on the standard menu, I counted 12 suitable options for veggies (not bad at just under a third of the menu in an omni restaurant). And flavour wise there’s a good balance, impressive for a chain to get even vaguely right for a cuisine that’s not always easy to nail. I’d previously sampled the Pho noodle soup and other veg options under every menu heading aside from bun noodles, so the obvious choice for me was to go for the bun cha gio chay. Bun noodles are thin rice vermicelli served cold, in this case topped with stir fried tofu and mushroom with salad bits, fried shallot, and fresh herbs. The crowning piece is the fried veggie spring roll (fried makes pretty much anything a winner in my book). Served alongside, in place of fish sauce, is a ginger soy dressing (tip: eat the spring roll dipped in and stir the rest through the salad). And you know what’s awesome? Pho’s spring rolls don’t ever seem to go soggy. Ever. The only thing that could have made this dish better would have been a wedge of lime. Morning glory (water spinach) has always been a favourite of mine in the few times I’ve been to Vietnam. The dish is typically made with fish sauce, but Pho will happily serve their stir fried morning glory up without, and it’s damn near perfect with a spoon or ten of the chilli vinegar table condiment. It lacks a little in salt which would be imparted by the fish sauce, so a splash or two of added soy sauce wouldn’t have gone amiss, but I loved it regardless. Drinks wise there are all the usual culprits of soda, tea, coffee, and juices, but Pho also has a selection of Vietnamese adult beverages too, including beers, vodka, and rice wine. I went for the Halida beer on recommendation of wait-staff (good choice) and have previously enjoyed the fresh lemonade with Vodka Hanoi. Pho is one of my go to restaurants both in London and Brighton, and the new Spitalfields location meets my expectations based on positive experiences at the other branches. The food is reasonably priced, the service is lightning fast even when busy, and it’s a comfortable atmosphere. I love that there are additional condiments on the table, too. Aside from the aforementioned chilli vinegar there are also other vegan options, including chilli paste, hoisin sauce, and sri racha (the only other thing I’d like to see is an MSG laden soy sauce as a veggie alternative to the bottles of fish sauce). I’ve now officially sampled every vegan option on the menu and I’ve got to say the bun noodles come pretty close to the top of the list. For me the winners have got to be Pho Chay Hue (hot and spicy tofu and mushroom soup) on a rainy day and Bun Cha Gio Chay otherwise. The Com Chay Cari is also great if you like thick and creamy coconut based curries and the Goi Ngo Sen (a deliciously tangy salad with lotus stem, green beans and cashew) is a fabulous summer option. Really you can’t go wrong with any of the veg options, and the staff are super well versed in veggie language so will understand clearly what you mean when you say no animal products. I will continue to eat here and to recommend it to friends, and I’m happy to see a branch open in the Shoreditch end of town. Now I can actually get a vegan lunch after I hit up all the Vietnamese shops in Hackney! I work near Spitalfields and I sometimes get Pho takeaway for lunch at the office. Bun cha gio chay is my go-to meal! It’s soooooooooo oooo ooooo good! 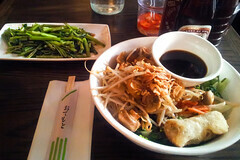 I love Pho too and agree that soy sauce would be a welcome alternative to fish sauce!